What lights do you have to light up magnum wine and champagne bottles? This specially designed light string is made with 35 bulbs spaced 3 inches apart for a total lit length of 8.5 feet. We've added an additional 36 inches of wire between the plug and first bulb. For most applications, an extension cord might not be necessary. Keep in mind the rich, warm color of this light string is produced by traditional incandescent bulbs so they will heat up especially if they are over-packed into a container. Show restraint in this area and make sure you don't "cork" your bottle. Let the heat escape. Also be cautious about putting a filled bottle or container onto a "heat sensitive" surface like ... a baby grand piano. These lights were just what I needed to use in a decorative wine bottle. Easy to install and the lights are bright! These lights shipped promptly and are exactly as advertised. The quality is very high. They are perfect for lighting up a decorative bottle. I am delighted to have found this source for decorative lighting. Specifically, short strings of mini-lights for crafting are difficult to find in our area...and if they ARE stocked, they sell out quickly. 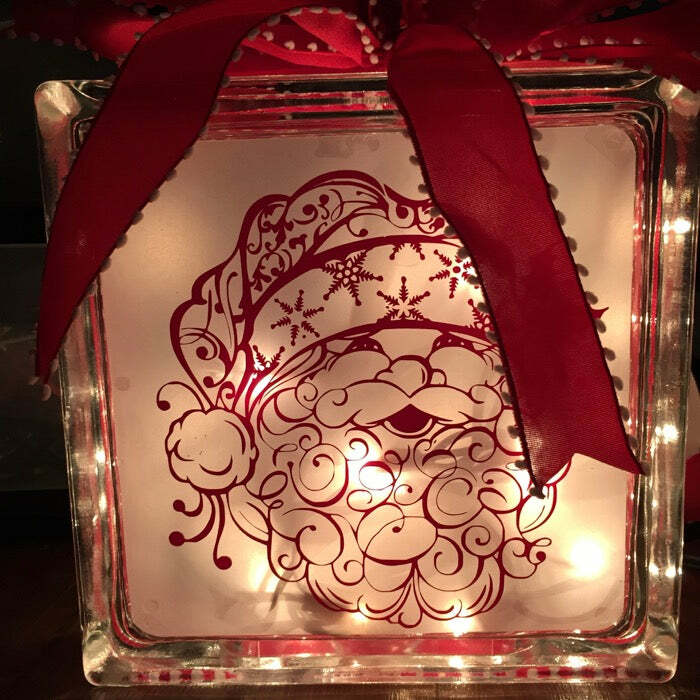 I used the white wire 35 clear minis to replace a burned-out string in a glass cube Christmas lamp I've had for years. They are still going strong in February, and I'm glad I ordered a few extra boxes since I found other places to use them throughout the holiday! These lights and the clips that I purchased to go with them, were the perfect replacement for the light string that quit working in my Christmas candy cane window decoration. It seemed a shame to have to throw it out just because the lights quit, and I have matching items in my other windows, so this was the perfect solution. I installed them in the candy cane when I received them, so now I'm all set for next Christmas! I purchased a couple of extra sets in case I have a problem next year. I only wish they made these in a tan color, as I have a sleigh and reindeer with the same problem and would love the be able to do the same thing with them but the white string would not work with the gold grapevine. I struggled to find lights that would be the correct length for my windows without being too short or too long. It would have been better to have plugs at both ends but I was able to connect these anyway. I used them on 3 windows outside - 2 strings per window. Good quality - they work as expected. I love the longer cord on these lights. The quality is much nicer then the dollar store lights I've been purchasing. These are definitely a better quality & worth the higher price. I started crafting with these types of lights and love that I will be able to find them all year around with this website. I bought a whole bunch from Walmart, but they did not have the color choices. The price is a little higher than what I wanted to pay for, but it will work for now. 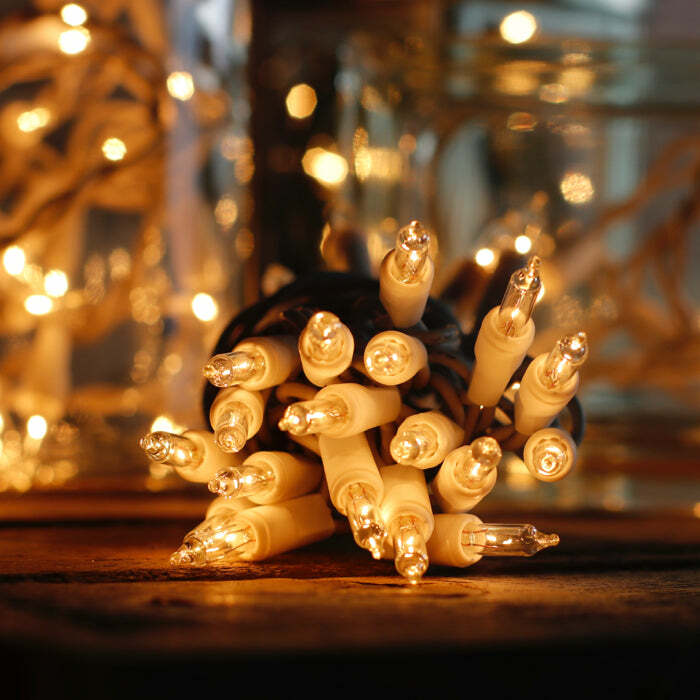 Christmas Light Source is the best place to buy light strings for craft projects. Value is great, delivery is ALWAYS quick, and they are great at resolving any issues, even when it is my mistake in ordering. Thanks for the great products and service! These were so hard to find in the store and I was so happy to find them here at Christmas Light Source at such a reasonable price. Fantastic lights for wine bottles! I purchased several clear, pink, amber and multi-colored mini lights. They look fantastic in my wine bottle lights. Thanks so much. Q: What is the total length of all the lights. A: These light strings have approximately 8.5 of lit length and 36 inches of wire between the plug and first bulb -- total length is 11.5 feet. Hope that helps!! Let us know if you have other questions. A: Sorry, it is with regret that we don't ship to Canada at this time due to issues with duties and fees. We also had issues with customs returning packages for no reason at the border. We'll resume shipping to Canada as soon as that process is more streamlined. A: I'm sorry we are having issues with our product question system and there has been a delay in our response. These lights only have a single male plug with the string ending in a single bulb so it's a great choice for using to thread into a bottle via a small opening. A hole the size of a dime might be a little too small but a nickel sized hole should be fine. Q: How long is this string? A: The lit portion of the light set is 8.5 feet and there is a 36 inch length of wire between the male plug and the first bulb. These lights are 3 inches apart. Hopefully that's close enough to work for your project. Our standard mini lights with two plugs that have 50 lights to the strand come with 2.5 inch spacing. A: The end of the strand is just a single mini light with 2 wires coming out of the base of the light. I'll see what we can do to add a photo! There is no problem filling the bottle from the top. Many of our customers drill a hole at the base of the bottle and install the lights through that - the hole just has to be larger than the base of the light.